Would you do anything to improve your kendo? And if it is very easy to do, would you do it? This is very easy to do but not many people do it. I have no idea why. People tend to practice their techniques a lot but not this. Just work on your kiai. Many underestimate the power of kiai. And many do not realise the kiai is the easiest thing for them to work on and it actually improves them really quickly. Questions on Kiai have been asked in Q&A. I now know many people out there are actually struggling how to make their kiai. Or they simply do not know the benefits of kiai. If you did not start kendo as a youngster, you tend not to shout as much. Many argue that kiai does not have to be loud. I agree with it. But I agree with it only if they know how to amplify their kiai or internal energy without shouting. It is said that as we improve, our kiai has to shift from yusei (voiced) to musei (unvoiced). 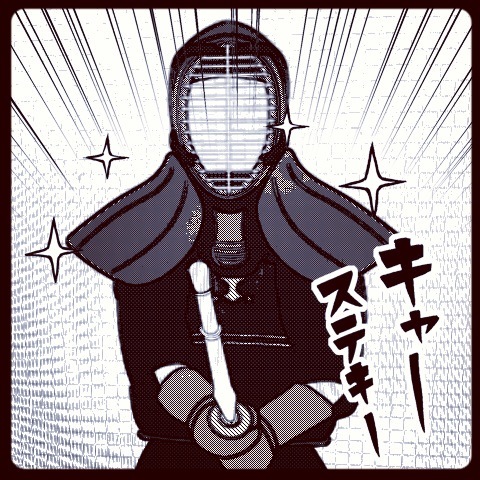 Therefore, if you see kendo between people with high grades, you do not hear them screaming much. The higher, the quieter. Many tend to imitate that. It is fine but what they do not know is that those people with high grades used to shout a lot. How to increase your kiai. The easiest way is to get angry or frustrated. If you do not know how to shout and how to bring your inner energy, you have to use something you are familiar with. Usually anger and frustration work very well to increase you kiai level. I was teaching my students the importance of kiai and how much they should shout before they do not have to shout. Most of my students are adults and they understand what I was saying but they just could not do what I was telling them to do, i.e. shout. The guy she was doing jigeiko (sparring) did not give her a chance to strike even though she was a beginner. I always tell my students to go easy on beginners because beginners have to learn a lot. She got pissed off. She screamed and screamed. Then her strikes got way better than the ones at the beginning of training. Her strikes got sharper and she did not hesitate to strike anymore. Since then, she knows how to shout and maintain her kiai level high. She needed to snap to learn what kiai would do to her kendo. Now she can do it without snapping. Anger and frustration help you to increase your kiai level. But don’t be rude to your training partners. This comes budo teachings. Control yourself. Anger and frustration are only the trigger for you to have a lot of kiai. And once you know how to have your kiai and keep the kiai level high, then you do not have to snap or get angry to have a good kiai. If you were a car, kiai would be petrol (gasoline). It does not matter how fast you could run, if you did not have petrol in you, you would not even move a bit. Even if you practice techniques a lot, if you do not have the right kiai, your techniques would not work as well as they would with the good kiai. He still has the loudest kiai. I will give you one more example. Do you know Masahiro Miyazaki sensei who won All Japan Kendo Championships (AJKC) more than 6 times? He won the championships twice in a row and he did it three times. (if my memory is correct). No one has won the AJKC twice in a row yet. But he did it three times. I happened to hear his kiai at Kyoto Taikai about two years ago. You think he would be very quiet but no! His kiai was the loudest and very distinctive. The quality was different. I cannot explain how but it was different. Strong, loud and full of energy. He is currently 7th dan and was 7th dan when I heard his kiai. If this 7th dan sensei who won AJKC more than 6 times had still the loudest kiai among all participants of Kyoto Taikai, then why not us? And trust me, your kendo will improve at the moment when you have the loudest kiai in your dojo. Kendo-Guide.Com Newsletter, Issue #015 – Improve kendo right away. via Kendo-Guide.Com Newsletter, Issue #015 – Improve kendo right away. This entry was posted in Concepts, Kendo and tagged Anger, Iga Kendo, IGA Kendo Club, Japan, kendo, Kiai, Kyoto, Martial arts, NHK, Philippines. Bookmark the permalink. ← Welcome Back Sensei and Junko-San!! !